I Am A Crazy Yarn Lady: today will be productive! today i found 2 birthday cards waiting for me in my mailbox, one from my dad and one from grandma, so nice of them to think of me. i must share the card my father sent, it is just hilarious and i must say.... speaks volumes! 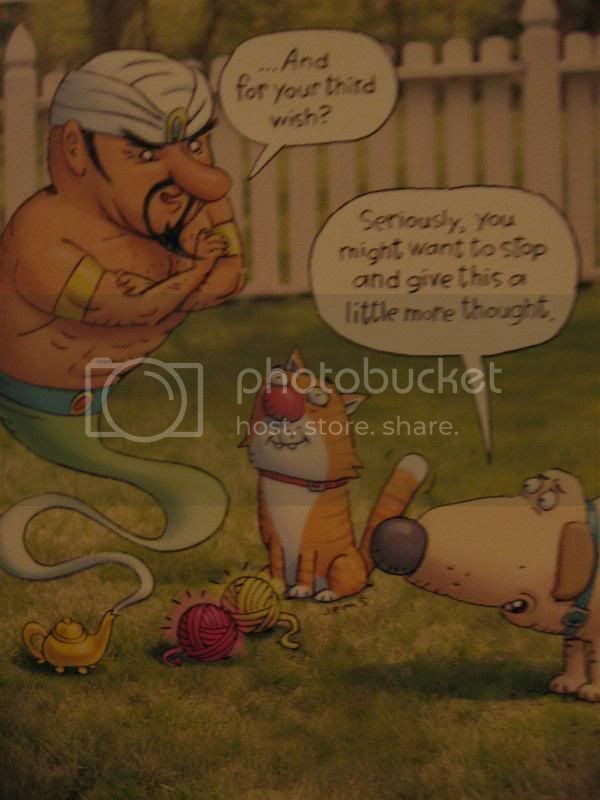 in case you can't read the text it says : Genie to cat "...and for your third wish?" Dog to cat "seriously, you might want to stop and give this a little more thought." 2 balls of "granted" yarn sit in front of the cat. its priceless... love shoebox, they have a card for everything! as for todays crafting news, i have been working on this knit scarf, it is a DNA cable (found here) and so far it is about 6 feet long, only one more foot to go! woohoo! this darn thing has taken me sooooo long to do, as it is tedious and since i used a yarn much thinner than the pattern called for (and i chose not to make it seaman style i did the cable the whole way through) i decided to make it 7 feet long to be wrapped around several times. i am in the home stretch now, and this last stretch seems to have taken forever. 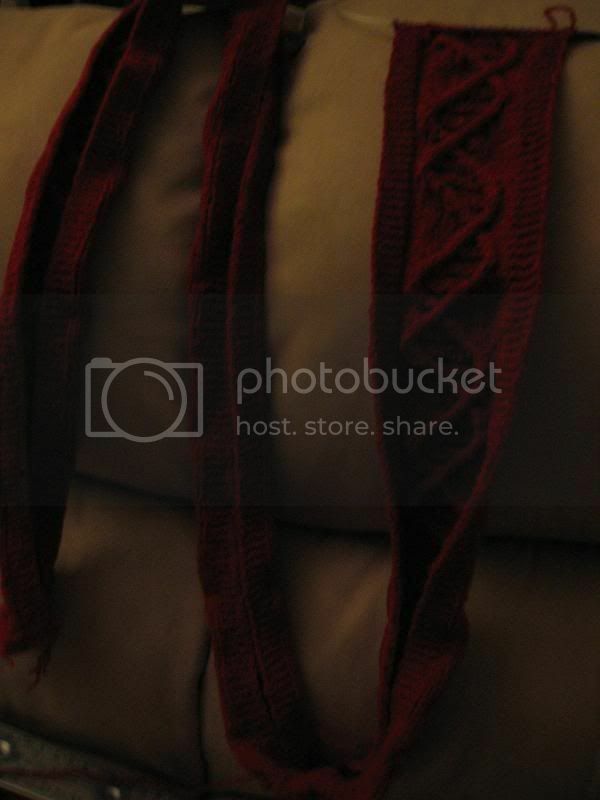 atleast i have the repeats down and no longer have to follow the pattern/graph and i have also mastered the cables and twisted stitches without using a cable needle, it was taking me twice as long having to use the cable needle 2 times every other row, that was frustating! i have been forcing myself to work on this sucker for the last few days to get it done, it is a christmas present (i see family in nov. so it has to be done by then) and i have other projects to get to. i know if i set it aside and start something else i will just pick it up, bind it off, and it will never be the intended length. so now while i have the movitation i am forcing myself to finish it off! on the GREEN side of this project, i am using what was once a very nice cashmere merino blend men's sweater. i unwound all of the pieces then wound one strand from each piece, sleeves/front/back into a 4 ply ball and this is the yarn i am using. i had bought some nice yarn to do it in then my sister said he likes dark orange, you can't really tell much from this picture but it is a nice rusty orange-redish color so i think this suits the color she said best. My next project is a throw for my mother for christmas. when she was here visiting in aug. she saw this yarn in my stash (vintage Samba soft cable cotton blend) in this lovely turquoise color. it came from an estate sale, and i love the color so well i bought it and had no idea what to use it for. she is currently re-doing her living room and would like an accent throw in the aqua-turquoise color so that is what she shall have! it is 20 50-gram balls so it will be a small lacey one, but one none-the-less. *LOL*. I love that card!! !